Bah, typo in the title. That should read GLTD II. This mod requires the extended eventhandlers mod! If you use GMJ_SightAdjustment, make sure to use the compatibility patch in the "examples" folder of the extended eventhandlers mod. Just put it in your @GMJ_SightAdjustment/addons folder. This mod adds an LCD overlay to the stock laser designator, designed to match the display featured in my NWD_ScopeFix mod. It does not depend on that mod, it just won't look as pretty without it. When you use the laser designator, the display will illuminate and you will be presented with three extra options in you action menu: RANGE, MARK, and O/R. RANGE mode pulses the laser once and displays the range. MARK mode marks the target just like pressing the fire button did before, but also illuminates the XMT light and returns continuous range updates. O/R mode operates identically to MARK mode, but is not subject to automatic shutdown due to overheating. If you are currently illuminating a target in MARK mode, either RANGE or MARK will turn the laser off, while selecting O/R will switch the laser to override mode while continuing to illuminate the target. In override mode, any of the three options will turn the laser off. Laser heat is kept track of internally, and you will no longer be able to fire the laser indefinitely. The maximum duty cycle is 5-1-5-1-5-30. That's on for 5 minutes and off for one minute repeated three times, followed by a 30 minute cool-down. This isn't perfectly simulated, but it should be close enough for now. If you keep the laser on for long enough, the HOT light will illuminate. This will warn you that the laser may shut itself off to prevent burnout. Once this happens, you will not be able to use the laser in MARK mode until it's cool (about 10-15 minutes). If you don't want the laser to shut off, you can switch to O/R mode and hope it doesn't break. If you leave it on for too long, it will break, and you won't be able to use it again in that mission. You can no longer toggle the laser with the fire button; you must use one of the three action menu options. The script will steal your batteries when you look through the optics to accomplish this (you'll get them back when you put the laser designator away). If you do not have any batteries, the display will not illuminate and the laser designator will be non-functional. The script should, if there are multiple lasers flying around, return only the range to the laser return closest to your aim point. I haven't tested this with multiple lasers, but at least it won't crash anymore. The display will flicker until it's loaded all ten digits. There will be a pause the first time it displays a 7, for instance. If you're using the "NWD_GLTD_EADisplay.pbo" file in addition to the main mod, the azimuth and elevation displays will read out in NATO standard mils. There are 6400 of these mils in a circle, so north is 0 mils, east is 1600 mils, south is 3200 mils, and west is 4800 mils. The elevation display has a range of +/- 400 mils. #The script won't work after a save/load. It won't break anything, however, as your laser marker will just revert to the default behavior. #I haven't tested this online. At this point I don't expect too many problems, but I can't make any guarantees. #If you run in a 5:4 resolution, the overlay won't line up with the display in my ScopeFix model. If you run in any other aspect ratio, they will. I'm not sure why this is, but I'll make a patch for 5:4 monitors if I ever figure it out. -- animated XMT and BAT lights "correctly"
Cool, this should be good for spotters. If we can only get the Single Lensed Spotting Device in ArmA. YESSSS!!! !...now this is what I've been waitin for...real tanks in arma.Great job if you can pull it off! Quote[/b] ]I plan to add this code to the tanks, eventually. I may even be able to use the same technique to make a floating reticle in the M1A1 optics for dynamic lead, if and when I code fire control computers. I swear to God, nothing on these forums has ever made me wet in my pants except this! Oh oh!! and some auxiliary HEAT and Sabot Periscopes! I forgot to mention it in the original post, but this mod requires the extended init eventhandler mod. Sorry if anyone couldn't get it to work. This mod works with a cutRsc overlaid on the screen. It's not possible to add animations to the optics themselves. This means I need some way to determine when to show the overlay, and when not to. For this mod, I have a continuous loop that checks the player's inventory for a laser designator and his animation state for a binoculars animation four times per second. The player shouldn't ever be carrying both binoculars and a laser designator, because that would be stupid. For tanks, I could just check for the player being a gunner in a specific tank since there are no internal tank views. There's hopefully something I can check for buttoned/unbuttoned, too. For helicopters, I have no idea. I don't know how to determine whether or not the gunner is looking at the weapons display. I would hope it's possible to add some kind of display toggle action and give it the "optics" shortcut, so that it's triggered whenever you press your optics key. I can't get shortcuts to work, but if I understand the way they're supposed to work, this might be a good idea. Nice one! I just can't wait for the tank version. Hope you'll figure it out! Then just a fake "measure distance" action initiating main gun adjustment...the end of ww2 tank gunnery. Ot: Any ideas how to make the main gun adjustments btw? The Addon dont work ! Although I installed all correctly. That is definitely an excellent addition to the game ! Thanks NWD, and good luck with further development ! Filefront is completely down for me. I cant see the picture, I cant see the file and actually, I cant reach the entire website. Must be something wrong there, or maybe only to some ip ranges. Yep, its fixed now took them a long time though. Now it works and ... this rangefinder-thing looks awesome. Just want to make sure that I'm putting the extended init eventhandler .pbo in the right folder. Â It goes into the addons folder of ArmA...correct? To use with the laser designator ? Would it be possible to add this inside the scope of a riffle that would be fastest to use ?? or in a binoculars ? i can not test it right now, but it should work if i just put it in the ballistic-modfolder, shouldn`t it? Rangefinder was on my wishlist, so appart from your other released work...thanks a lot. Haven't tested it, but it is installed. Hope it works in MP (will soon find out). Like suggested, it would be nice if we could have this within the binoculars or merged into a binorangefinder addon itself. 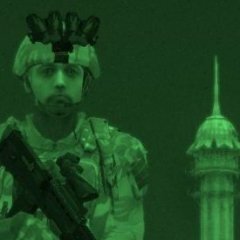 Afaik arma (like ofp) doesn't allow multiple binos so it will need to be a replacement pack. I had a tripod bino in the making (not sure if it is actually a rangefinder) but the integrated range finder would of been a most with it for sniping . Keep up the nice modifications. It is these 'small' things that make arma great imho. ArmA allows as many different binoculars as you want, as far as I can tell. The only hardcode I've run into is the "Binocular" action (the "b" key), which only works with the "Binocular" weapon. You can still select any other binoculars with the action menu. There's a "useAsBinocular" boolean in the config that specifies the binoculars animation, so that's not a problem. Even better, the default laser designator is just a pair of binoculars with a laser magazine attached. I had no problems duplicating it in testing, so I don't think the "Laserdesignator" name has any significance to the hardcode. As of yet, I don't know how to create a dedicated rangefinder that won't work as a designator if you press the fire button. If I knew how to run the script when the player pressed the fire button, that would change. If I can create a "Laserbeam" with a script, that might work too. I have a lot of doubts about that, though. The other option is to create a very fast bullet and create a laser target where it hits, but I really don't want to have to do that. The other option is to create a very fast bullet and create a laser target where it hits, but I really don't want to have to do that. Now that would be a sight. Laze a target and kaboom! Oops, I think i just hit a fuel tank on accident. Well... so much for not being seen. Well I downloaded it installed and it doesnt work, I have the mod folder with the eventhandler in it and into the addon folder of arma but still no go. How are you using it, and how is it failing? It probably won't work if you just add the rangefinder to your inventory and try it out. You should see the display pop up, but the range and mark commands might only work if you turn the laser on with the fire button. If you want the technical reason, it's because my code assumes that the laser designator is in weapon index 2. There doesn't seem to be any way to determine weapon index for the "UseWeapon" action, and I can't get any other command to fire a player's laser designator. I'm still looking into this. Try going into the editor and adding nothing but a "SF Recon" soldier as player. Bring up your laser designator, and it should work as I've described in the first post, assuming everything's installed correctly. You should have the @NWD_Rangefinder folder from the download in your ArmA directory, and you should have "Extended_Init_EventHandlers.pbo" from the extended init mod in the ArmA addons folder.